Everything is good, just a bit noisy as it is close to the train station, in particular on the weekend. The hotel is pleasant but expensive for what it offers. The room is quite small and there is no wardrobe - just a hanging space over a small chest where you can put a case. There are no toiletries - just a soap dispenser over the basin and bath. Everything is very clean and the staff are pleasant. The reception area is just at the end of the bar which is very dark. There is no room service. Every room door needs to be pulled shut, which means frequent banging of doors through the night. I had a fantastic stay at this very clean friendly hotel. A great location in the city centre perfectly situated. Would definately revisit! it has good location which close to central station and shopping street. 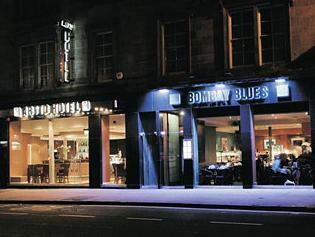 Good simple hotel located right next to Glasgow Central Station. Attached to moderately good Indian restaurant, which always has an all-you-can eat buffet on offer! i enjoyed my stay but i found the street noise quite bad.window didn't close properly which didn't help. Bathroom wash hand basin when tap was put on water spilt all over the floor. Bath was chipped. No Wi Fi No Parking facilities. Noise all night from Beer Garden below. very easy checkin and check out. staff were able to help us with all the directions we needed for our stay. rooms were a good size.beds were a good size and very comfortable. this hotel is close to the central station, to the underground, main bus lines and to the pick up place for the airport shuttle. the staff is friendly, helpful and serviceminded. my single room was small but cosy, the bathroom newly decorated. only draw back - several items mounted om the wall (e.g. lamps, the thing for the shower) were nearly coming off (rawlplugs too small?) and the handle on one drawer had been broken off. Arrived for a one night stay. Hotel was in a great location and looked great from the outside. Staff were friendly and helpful. The room was spacious enough and clean. Very friendly staff with reception based in a lively bar area on the ground floor. Good curry restaurant (with a la carte discount for hotel guests) on ground floor. Very clean and quiet room at rear of hotel. Central location for all glasgow has to offer. would not hesitate to stay over again at this hotel.from the minute you check in you are made to feel at home,barstaff especialyy simon,wife wanted to take him home with us,all he seemed to do was clean.food 1st class and very reasonably priced.keep up the goodwork artto and see you all again soon. I stuggled getting in the door with all of my luggage and the receptionist just watched and did not offer to assist by holding the non automated door or anything. Then, when we settled in to go to sleep (not early approx 11pm) we were kept up until about 2 am due to the LOUD music coming from the bar down stairs that is part of the lobby of the hotel. I called around 12am and told them that it was VERY loud in our room and they said that they would tell the people to turn the music down. They said they thought it might be a person in a room near us. We waited a few minutes and the music was turned down a little. Not nearly enough to sleep. So the next morning when we headed out for the day, I told the lady at the desk about our night and she said that it shouldn't happen again and she was certain that whomever it was would more than likely check out that day. I told her that they would have to change our room if it happened again because it was terrible and that it was coming from the floor and the only thing under our room was their bar. Lucky for us the second night the bar was closed and we slept in peace. สถานีรถไฟ Glasgow Central - ระยะ 0.09 กม.